Waterbury Clock Co. hanging clock, "General" ca. 1914. Oak case has original finish, outside dia. is 18 inches, depth is extra thick 5.5 inches, extra nice Waterbury labels on back. 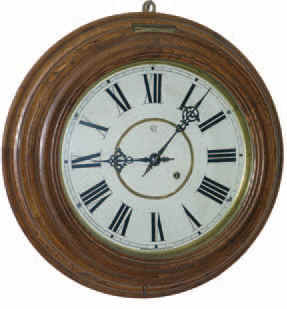 Glass, hands and pendulum are old, extra crisp 12 inches dial with a few minor flakes at couple of mounting screws. Time only 8- day movement runs fine. Original brass push in latch on bottom of case keeps bezel closed. Ly- Waterbury No. 653.